Tribhuvan University, Exam Controller Office today publishes a notice regarding exam center amendment for 3 Years LLB First year. The examination of LLB First year will commence from Baishakh 2, 2076. 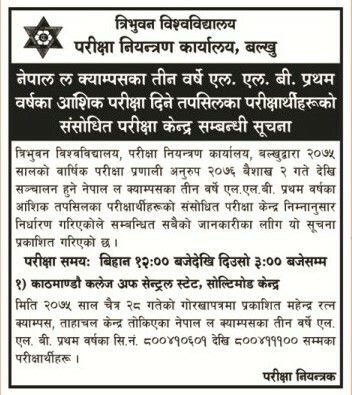 As per the new notice the examinations of LLB First Year of students of Nepal Law Campus will be held at Kathmandu College of Central State. Examination time: 12 to 3 PM.